So how do professional services firms hone in on these seven critical capabilities? 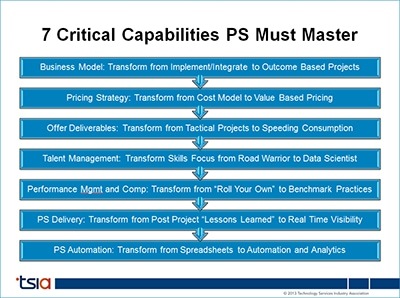 When Planview was asked to be a part of this analysis, there was a natural “Eureka!” moment. As described in the last half of the State of Professional Services: 2013 report, the new Services Resource Planning enterprise technology makes a strong claim to automating five of these seven critical capabilities. Specifically, as a variation and improvement to typical professional services automation (PSA), a Service Resource Planning (SRP) solution is focused solely on the processes between sales and invoicing (or as the process is more often described, including on this blog, Quote-to-Cash). Because the SRP technology has this specific focus, the ability to provide automation and visibility into business model, pricing strategy, offer deliverables, retaining talent, and PS delivery is at the core of what it has been designed to do. Perhaps this is also why Service Performance Insight, in a white paper titled “Dwell or Excel: Leadership in Large Professional Services Organizations”, that was recently published that in 2012, PS organizations with an SRP solution that was integrated with other LOB technologies saw an 8% improvement in billable utilization, 2% improvement in project margin, and saw a $30K increase in revenue-per-employee. Download the TSIA Research Report, The State of Professional Services: 2013. Download the cited research by Service Performance Insight, Dwell or Excel: Leadership and the Large PSO. If you would any more information about these findings, including links to analyst webcasts and more research, email market@planview.com or comment below.